Lit. Phoenix Hall. The Hououdou is the central hall *Chuudou 中堂 of the Byoudouin 平等院, built in 1053 as a villa in Kyoto by the Fujiwara 藤原 family, but later transformed into a temple for the worship of *Amida 阿弥陀. The entire plan of the Hououdou is symmetrical, and represents a phoenix ready to fly. The central hall is 3×2 bays (14.24m) wide, has a wooden floor, and a hip and gable roof. The roof is crowned with two guilt-bronze statues of phoenix birds. Wing corridors on each side of the central hall have 6 bays in the ridge direction and two bays on each end, about 3.94m wide, extend forward at right angles towards a pond. Additional structures with double roofs are placed on the corners where corridors change direction. The top roof on each of these corner structures is pyramidal *hougyou yane 方形屋根. The corridors are double storied with a simple gable roof covered with tile *hongawarabuki 本瓦葺. The rear corridor which extends from the back of the central hall is seven bays long by one bay wide, and like the rest of the building has a tiled, gable roof. The pillars on the outside surrounding the central hall are square, while all other pillars are circular. 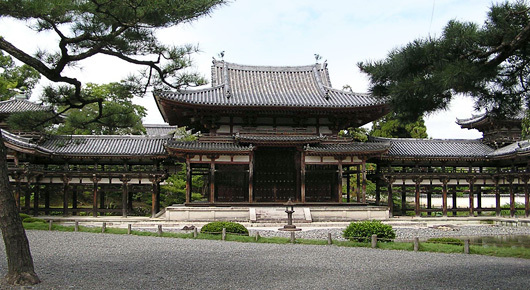 The central hall has a pent roof placed around the core of the hall, but at the center front the roof has been raised so that glimpses of the Amida can be seen from across the pond. The tie beams of the pent roofs are small in comparison to the main pillars of the core of the building *moya 母屋, which are tall and have three stepped bracket complexes *mitesaki tokyou 三手先斗きょう with tail rafters *odaruki 尾垂木. Because the Amida Nyoraizou 阿弥陀如来像 is 4.83m high the central hall had to be made to accommodate its height. The ceiling of the central hall is finely latticed and coffered *kogumi goutenjou 小組格天井 surrounded by short curved, non supporting members to form a transition to the slightly lower level part of the ceiling. The Amida Nyoraizou in the Hououdou is the only extant piece by the master sculptor Jouchou 定朝 and is considered the best surviving manifestation of the *wayou 和様 style in sculpture. See *Jouchouyou 定朝様. The Hououdou is also famous for the small carved figures of flying heavenly figures *hiten 飛天, on the interior walls of the central hall, and the splendid openwork nimbus *kouhai 光背, and canopy *tengai 天蓋, over the statue.